Jim Holbrook is stepping into the unknown. 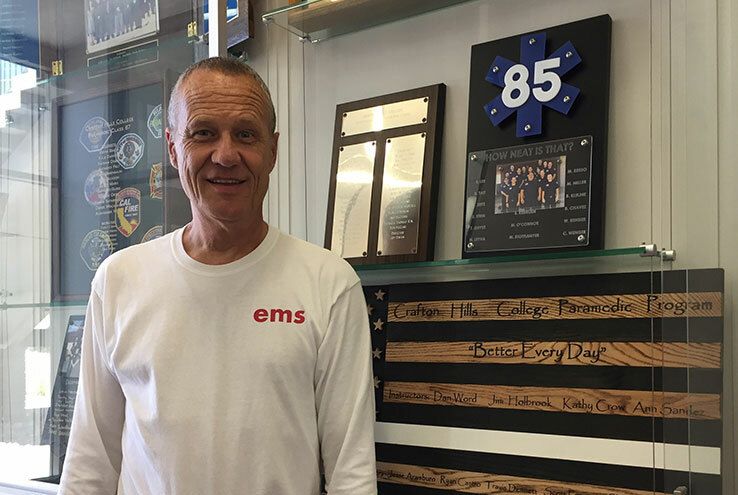 After 40 years of teaching, the longtime Crafton Hills College professor of emergency services has retired. His last day was June 30. The plan is to stay busy in whatever capacity that may be. Holbrook knows he wants to learn how to play the ukulele and remain involved in education, but no set plans have come to fruition just yet. Holbrook applies the same laidback approach to whatever comes his way, including his career. He had no intentions on becoming a teacher until he was approached by Pat Thomas, CHC’s first paramedic program director, to precept a student. Teaching allowed Holbrook to expose his students to something they’ve never experienced before. In the world of emergency services, the patient comes first. That means there’s little time for distraction, including taking issue with someone’s race or orientation, he said. The decision for Holbrook to retire was not years in the making as it can be for others. While he did talk to others about the possibility of “hanging up his hat,” he did not have a concrete retirement date in mind. It just happened. And while walking away from teaching full-time presents an unknown, one thing Holbrook said he will miss the most is the students at Crafton Hills and they journey they went on together. “It was rewarding. For you to be able to take someone who believed one way and was open enough to allow somebody else’s belief system to be real, they grow up,” he said. “And the other thing is they challenged me in the sense that, ‘Alright, you’re an old hippie. So, how did you get to that point?’ I don’t want them to think like me. They’re way better role models than mine and should disagree with me.